Big Lead story..... It is not there...... Instead we see a great deal of fracturing as expected from a much warmer October Arctic Ocean. October 27 2016 NOAA IR HRPT Northern Ellesmere Island Canada. Finally a clearing after more than a month of clouds. The densest sea ice of the Arctic world appeared de-compacted, disassembled by a massive dispersion event, looked more like new ice just freezing interlaced with thousands of leads. Speaking of which, the Big Lead footprint is glaringly absent, it may last for weeks after it opens, but not much of a sign of it here. This is clear evidence of laterally decompressed sea ice. The big lead is a construct of very dense sea ice, it occurs during the coldest days of winter as well as summer, what is needed for it to show is a strong Tidal event. Usually during the full or new moon periods. This picture was taken during a near new moon phase. Of interest is also Kennedy Channel, clogged with broken up sea ice flowing with the Tidal driven current. NOAA HRPT IR with different darkness setting than above, November 13 2012. 2012 densest sea ice then was much more consolidated, fracturing a whole lot less, there was some CAA open water shoreline open water that froze (bottom left), but the big lead(s) was prominent, a sure sign of stronger compaction . Kennedy Channel was much more open, again a sign of a stronger consolidated pack. 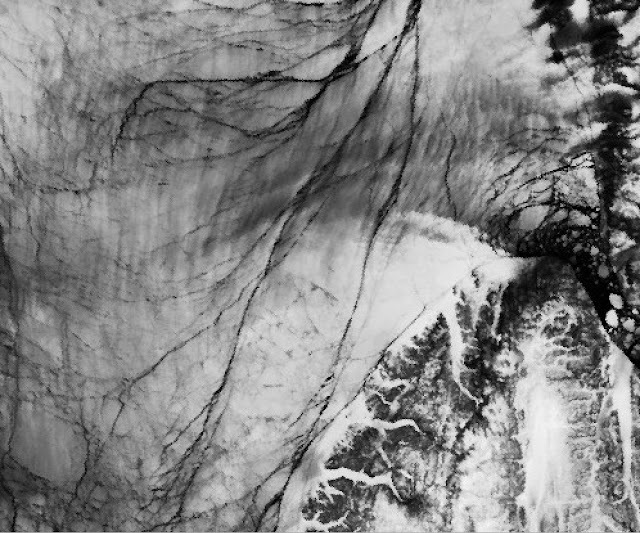 What we have just observed was the result of a complex chain of events which essentially rendered early winter densest pack ice much weaker, laced thousands of leads giving away heat enough to foster lingering Cyclones to keep the Arctic Ocean mostly covered with clouds. A few days ago, the coldest air was from the center of Canadian Arctic Archipelago, and lesser over Northeast Russia merged. 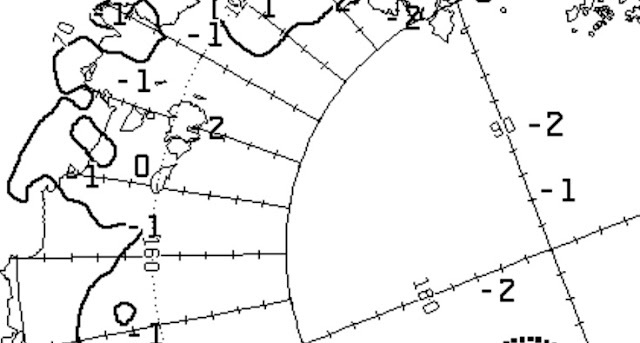 Just before, EX Hurricane Nicole pushed a segment of the North Atlantic jet stream deep towards the North Pole, to the South of the stream was an Anticyclone which helped consolidate Higher pressure over Center of Arctic Ocean making join the 2 coldest air zones from the continents. We now see how bad the densest sea ice is, in effect a broken up shadow of its former self, a collage of thousands of pieces just freezing together at this time. Sea ice dynamics are now drastically different. Expect the unexpected from this time onwards. WD October 28, 2016. 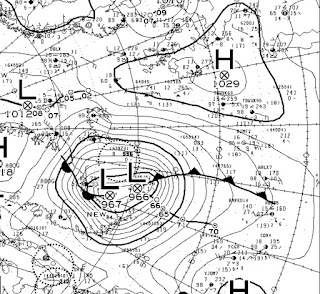 Lower pressure over the Arctic Ocean, the Cyclone dominated Arctic had a significant circulation makeover, NOAA Daily composites October 21-24 2016. SFSU jet stream animation October 14-18, 2016, usually marking Low pressures to the North of the main jet stream. However hurricane Nicole exhibited some unique features which are interesting. 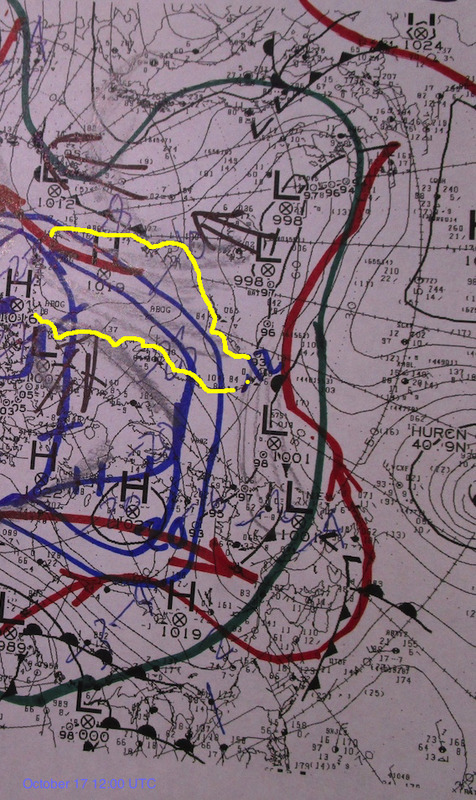 Zoomed SFSU animation Oct 14-18, As Post Tropical Storm Nicole approached South East Greenland (end of animation loop), the Jet stream bent Northwards, as if the ex-Hurricane was a High pressure rather than a Cyclone. 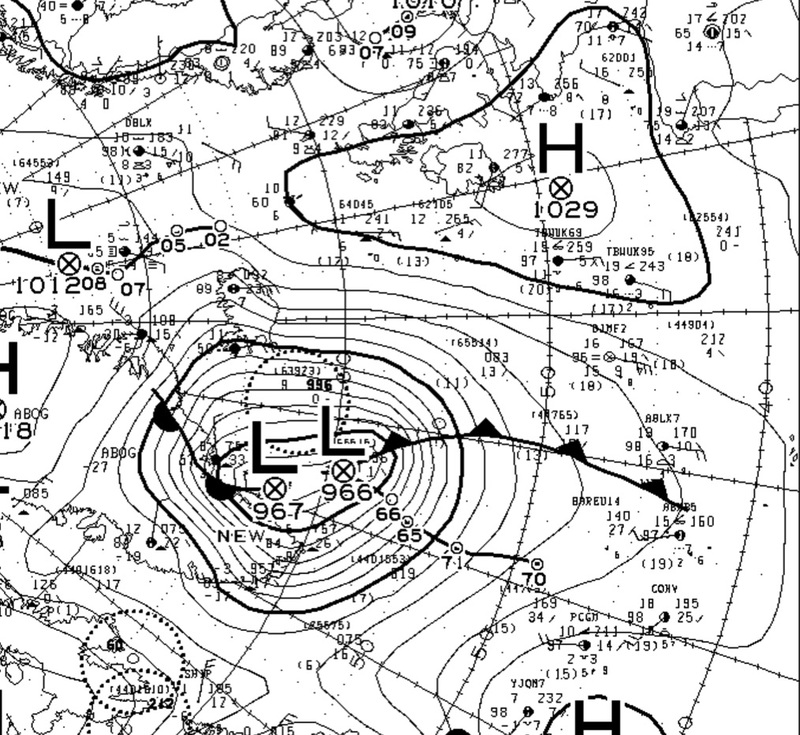 Note the beginning of this animation small 993 mb Cyclone over Ireland having the Jet stream to its Southern perimeter. 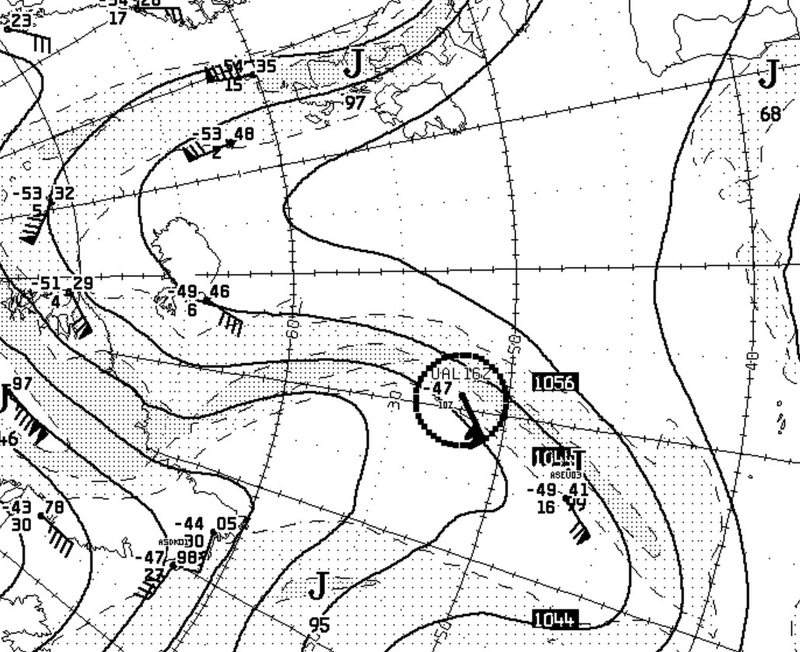 <<<<<< Small 993 mb Cyclone with Southern Perimeter jet stream (traced in red), quite normal and expected. 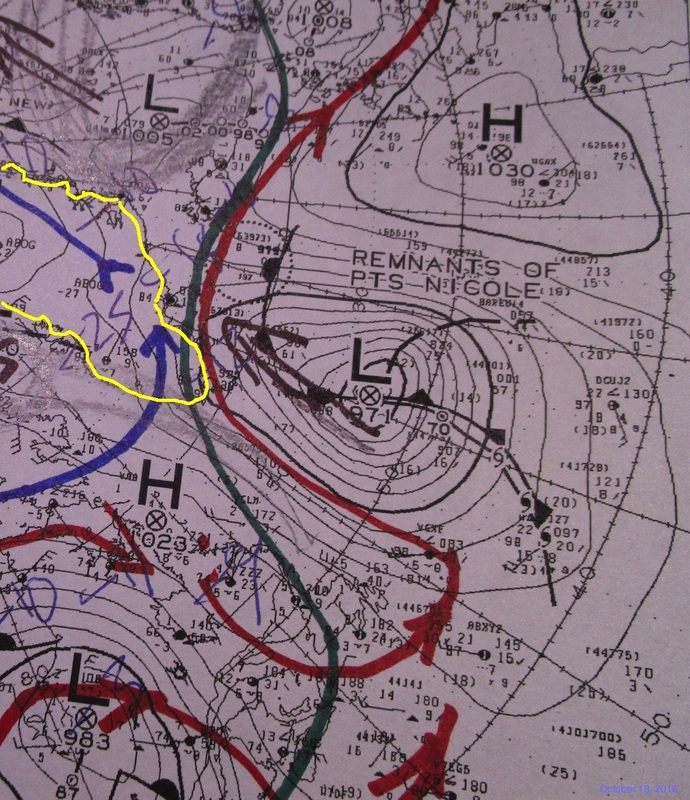 <<<<<<<<<<<Tropical Storm Nicole flanked to the North by jet stream (traced in red). CMC October 17, 2016 12:00 UTC. <<<<<<< Red line South of Greenland is the jet stream. 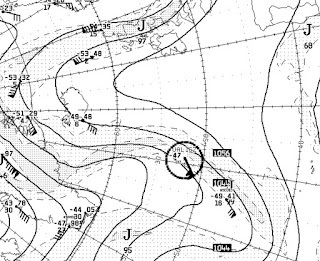 <<<<<<< PTS Nicole still heading towards the Pole, clearly bent and moved the jet stream Northwards. 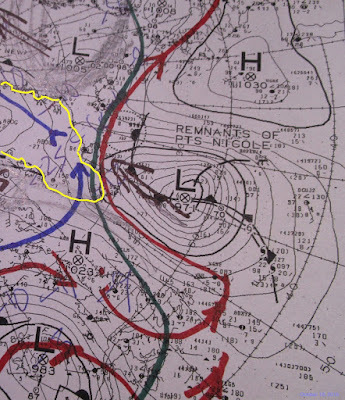 Most often (but not always) Cyclones make the jet stream do the opposite, bend Southwards. This is clearly an interesting observation, approaching towards the North Atlantic run of the mill Cyclones usually influence the jet stream to move to their South. <<< Just starting jet at right of frame. 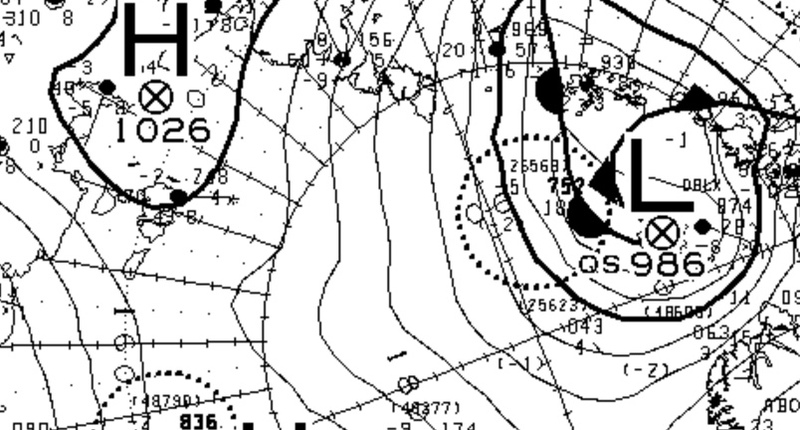 CMC October 19, 12:00 UTC surface chart. As I write the Low is 962 mb. 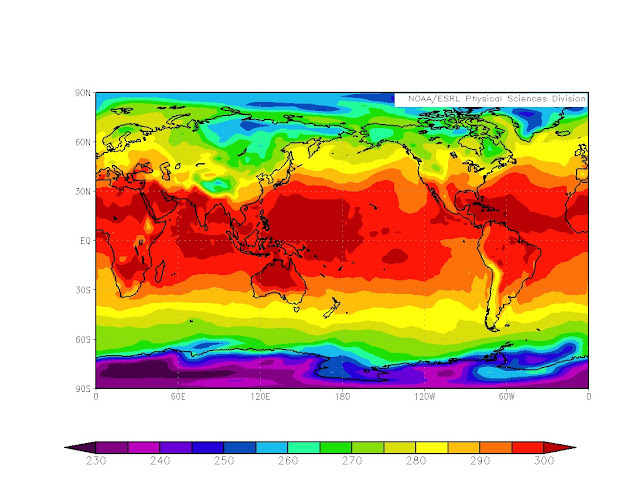 Current North of 80N atmospheric temperatures are fabulously warmer than 2012 for quite a while. There comes a point when collective evidence is simply overwhelming, when there can be simplified conclusions drawn from it. The joint stable long lasting cloud cover (despite the presence of moderate Anticyclones), the persistent Cyclones hovering over the Arctic Ocean and exceedingly warm surface pan Arctic temperatures indicate a common denominator: current sea ice condition is extensively weakened, is thinner with intermixed myriad leads of open water. To claim otherwise, defies what we know from past sea ice to lower atmosphere interactions. 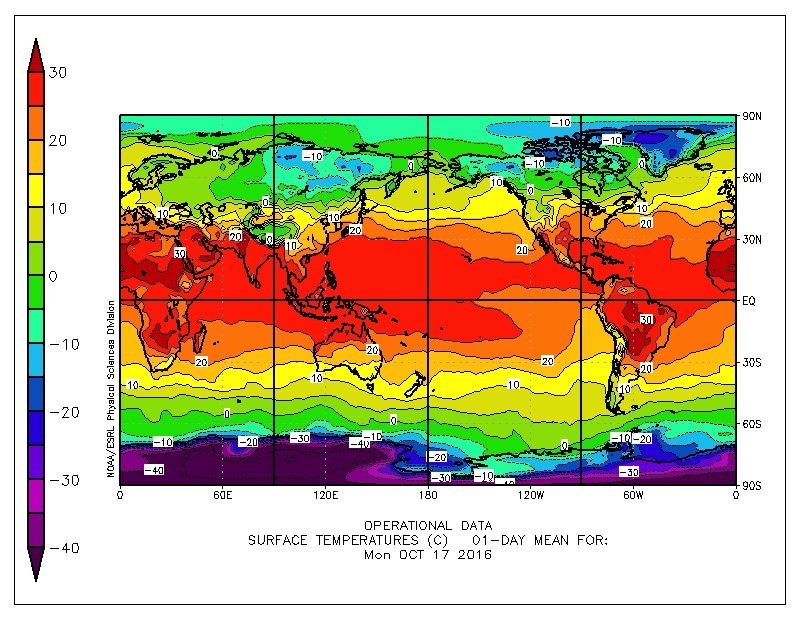 Arctic Ocean surface air temperatures were much colder same date October 17 2012, NOAA (above). -20 to -25 for significant areas. Compared to 2016 which was about -10 C daily average at coldest, indicating the mere beginning of winter at the densest pack location. 2012 densest pack was largely unscathed compared to 2016. Winter 2012 started a whole lot more over the Arctic Ocean dense pack area with stable over the sea ice pack Anticyclones in darkness, the densest pack usually can do that every autumn. 2016 densest pack suffered a grand de-coiling wave at about sea ice minima of record, along with dispersive atmospheric circulation caused by persistent Cyclones North of Beaufort sea. JAXA extent artifact or floating snow? JAXA October 13 to 14, 14 recognized by extent gains in Laptev sea. Central top of capture. 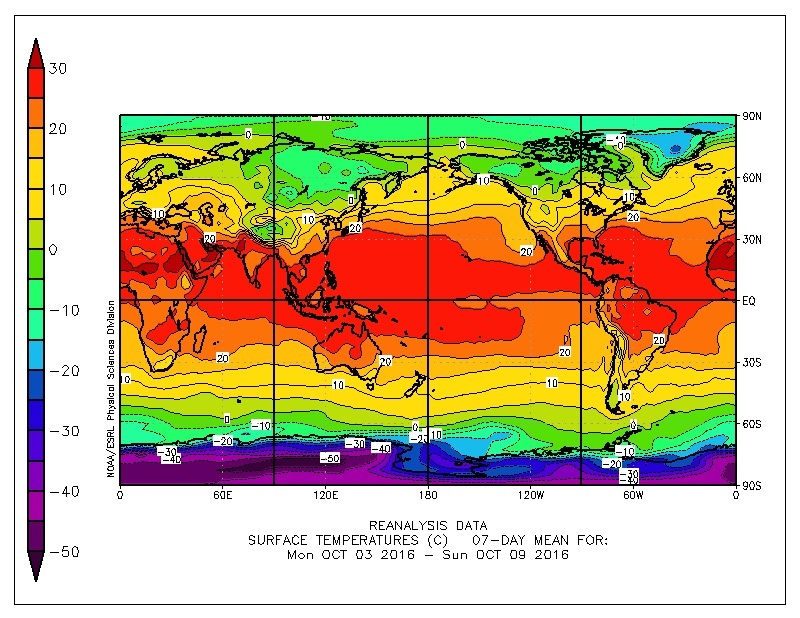 CMC October 15 sea surface temperatures were equally very warm. NOAA 01:00 to 05:00 UTC ir animation. Despite the presence of a moderate Anticyclone the area in question was loaded with multi layered clouds. The chance of snow showers were quite good. From the same time period we can theoretically trace where the jet stream may be, as above, South of coldest air anomalies. which are uniquely over land. Theory fits with reality, therefore very warm Arctic Ocean, gets replenished by warm Pacific advection, a dynamic feedback loop. A colder Arctic Ocean would have a completely different jet stream profile. A colder Arctic would flatten the undulations. 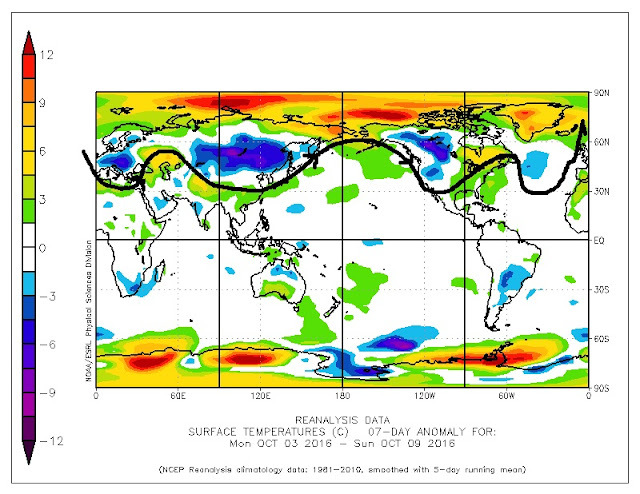 The warmth didn't mix as much with the Arctic in 87 (left), while winter was naturally expansive in October, 2016 (right) has a different temperature layout for a good chunk of the Northern Hemisphere. Radical change in sea and ice surface temperatures would absolutely naturally contribute to cause the difference. By far the poorest state of North Pole sea ice observed for October, indicates a hellish icescape of badly broken up sea ice interspersed with myriad of leads with thin ice and open water. Sea surface temperature -1.8 C is a thermal balance construct needing very cold air in especially warmer seas. Open sea water easily doesn't freeze at -3 C surface temperatures. 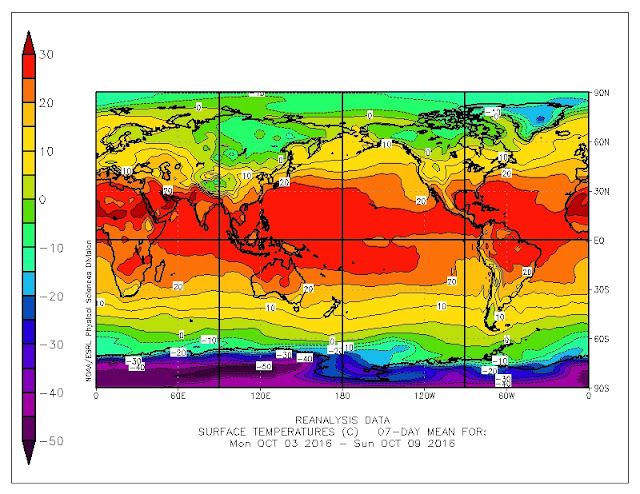 Especially because it is at -1.5 C, the vast majority of ice formed at colder normal -1.8 C. Cooler surface temperatures will eventually cause top sea water to be at -1.8 C. But for this to happen, it usually requires sustained cooling at -11 C, because the water column has been warmed all summer. Once top of water hits -1.8 C it solidifies. Afterwards, further cooling is needed as sea ice thickens, in order to always achieve the needed -1.8 C, otherwise further down sea warmth increases the top water layer temp. High Arctic warm heat source in October is usually from the sea, therefore a tendency for sea water to maintain its column temperature needs to be vanquished by extremely cold air. 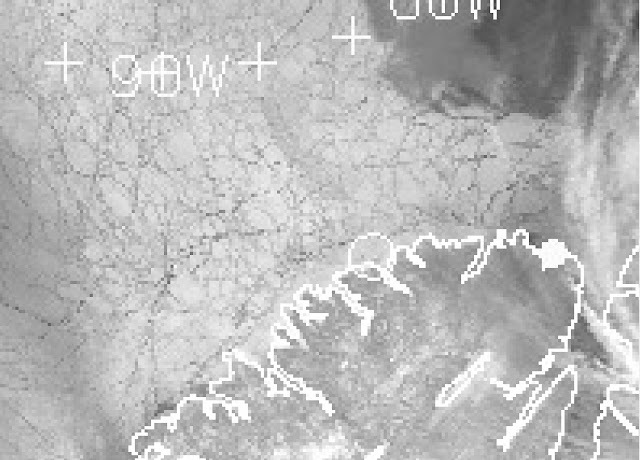 One week old sea ice from mainly rainfall, is extremely fragile brakes on contact. Can't carry any significant weight, is rubbery, very much appearing like sea ice further North near North Pole. It formed in much warmer temperatures. Extraordinary season continues with exemplary exceptional summer clouds in October at 80 N latitude. Is it because of the low sun elevation ? No, the clouds portrayed here are simply outstandingly big and high. With tops 57,000 feet high according to the sun shadow. By now, the likely lower sea surface saline surface froze despite warmer than -1.8 C sea water.